The Harry Potter saga has cradled the childhood of many of us and still enchants the younger ones. For a magical adventure of your own, join Jancarthier Voyages on 18-21 May of next year. Adive into the heart of the universe of the young wizard through a visit of Warner Bros. studios, a few kilometres outside London, where the 8 films were shot. A unique opportunity to walk in the footsteps of Harry Potter and explore the wonders of the world of wizards! The adventure begins when getting off the Eurostar at St Pancras International station, where a bi-lingual assistant will take you to your hotel. Whether it be the Novotel London West, the Thistle City Barbican or the Hilton London Kensington or similar, you will stay in a 4-star hotel with all comforts, located in the centre of London. The next morning, it is from there the coach will take you to your dream destination, Leavesden studios, 32 km northwest of London, for a special visit: “The making of Harry Potter”. 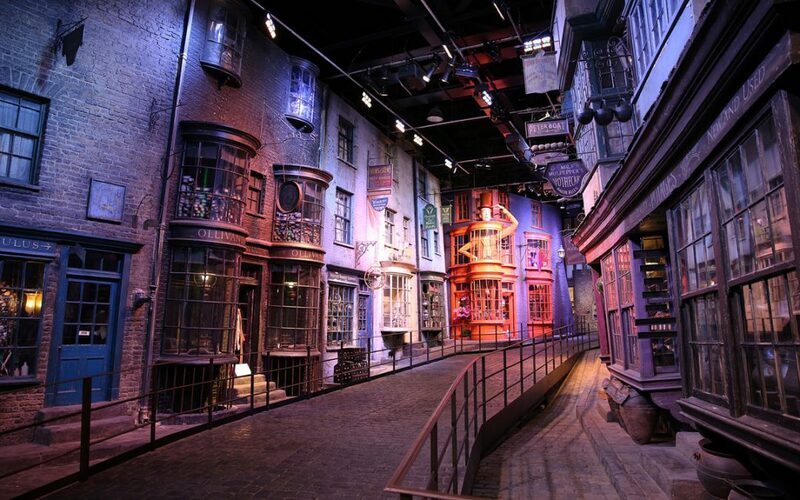 This studio-visit of 3 hours allows you to browse the emblematic setting of the J.K. Rowling hero (the Great Hall, the Forbidden forest, Platform 9 ¾ and the Diagon Alley), to discover the movie props (Potions Classroom, Memory Cabinet, etc. ), to have a close look at the costumes and understand the many special effects that have brought the wonderful world of Harry Potter to life. The finishing note of the tour (on option) is simply stunning: the visitor will be photographed on a green background and then by “photo-magic”, finds himself or herself, for example, flying on a magic broom… To be able to say that “I was at Hogwarts”! The last two days are spent on a visit to London (Oyster Card 3 days and bus pass Hop-on Hop-off included) because we cannot go to the capital without discovering, or rediscovering, the emblematic sites of the city: Big Ben, Tower Bridge, Westminster, Trafalgar Square, Buckingham Palace… and indulge in a shopping spree in the great mythical English stores (Harrods, Harvey Nichols…). An experience not to be missed for all the “Muggles”! Monday to Friday from 10 a.m. to 7 p.m. Saturday from 10 a.m. to 1 p.m. and 3 p.m. to 7 p.m.